Which of the following statements is scientifically testable? No. Being scary is not a physical property. Instead, it is an opinion. Some people might think they are scary, while other people might think they are not. These alligators have sharp teeth. Yes! 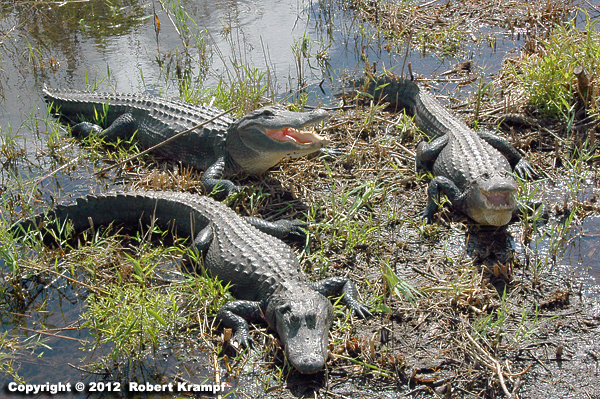 Careful observation would show that all three of these alligators have very sharp teeth. Anyone who put their hand into the mouth of these alligators would find out quickly that sharp teeth are a measurable, physical property that is scientifically testable. Remember that scientifically testable properties are going to be the same, no matter who tests them. For example, these alligators each have four legs, scaly skin, and lungs for breathing air. They are carnivorous, which means that they eat other animals. They are reptiles, and they lay eggs. All of that information is based on physical evidence that can be checked and verified. You could count their legs, examine their skin, etc. These things are scientifically testable. On the other hand, opinions are a property of the observer, not the object. I may think alligators are interesting. Someone else may thing they are scary, or ugly, or boring. You could test different people, to see if they think alligators are scary, but you can't test the alligator to see if it is scary. Opinions are not scientific evidence about the object. These alligators have ugly eyes. No. Again, this is an opinion, not a measurable, physical property. I happen to think that alligators have pretty eyes. No. Lazy is not a measurable property. I might call them lazy, but you might think that they are just waiting for something tasty to walk by. Lazy is an opinion, and is not scientifically testable.